Former Trump legal spokesman Mark Corallo said on an ABC News podcast that Hope Hicks, who previously served as White House communications director, told him that "nobody's ever going to see" the documents about the drafting of a misleading statement on the infamous 2016 Trump Tower meeting. Context: In the original statement Trump dictated aboard Air Force One, he claimed the meeting between a Kremlin-linked lawyer and Donald Trump Jr. — first reported by the New York Times — was about Russian adoptions. Trump later revealed in a tweet that the purpose of the meeting was to get dirt on Hillary Clinton, essentially admitting that his first statement misled the American people. 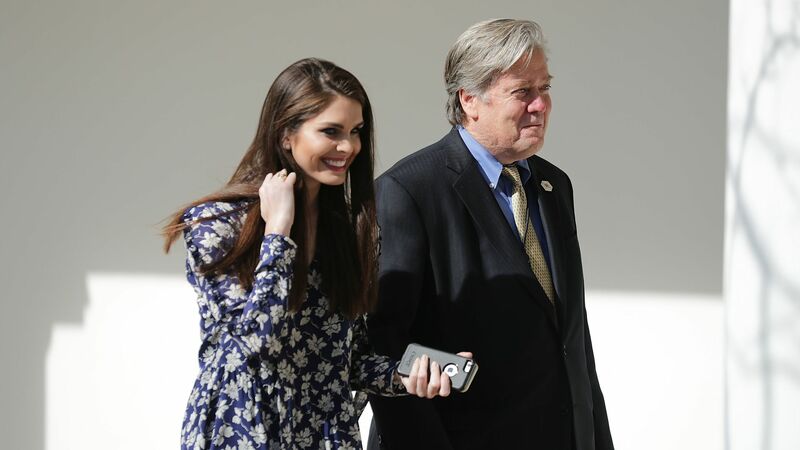 Why it matters: Corallo said that during his interviews with special counsel Robert Mueller's office, investigators told him: "Miss Hicks says that that didn't happen." Corallo noted that he thinks that "if you're going to charge impeachable offenses in articles of impeachment. Those are the kinds of stories that come up." "I pointed out that the statement was inaccurate and that there were documents, that I understood ... would prove that. [Hicks] said, well nobody's ever going to see those documents. Which you know made my throat dry up immediately. ... A. that you would say something like that in the presence of the president of the United States. That you would not be aware that that could be construed as obstruction. Right? The threat to withhold documents? Like what does that mean that no one's ever going to see them? What are you gonna destroy them? She showed a complete lack of understanding of the situation and was completely in over her head." On releasing the Mueller report: “I think we should see the entire report. … We all have a right to know." Corallo added that he thinks the American people have "a right to know" about the source material, too. On Trump hiring his children to work for his White House: “I think it's un-American in some ways. ... I had nothing against Ivanka Trump and Jared Kushner. They were you know lovely people all of that. What bothers me is that we should try to be consistent. If Hillary Clinton had won the election and installed Chelsea as one of her senior advisers, every Republican in town would be screaming bloody murder, nepotism, nepotism." On Trump’s awareness of the country: “I don't think he really understands America. I think that the president, like other members of his family, and a lot of people around him see America in terms of dollars and cents. We're not just an economy, we're a nation."